On Wednesday evening former Vermont Governor Howard Dean spoke to a large and diverse crowd at UCLA as part of the Luskin Lecture Series. The event, hosted by the UCLA Luskin School of Public Affairs, brought together donors and invited guests – several of whom are currently UCLA undergraduates – at the Covel Commons on campus. Governor Dean spoke about why “Campaigns Matter.” It boiled down to how 20-35 year olds, with the help of the internet, are already transforming not just our nation, but our planet. The theme for the night was about how a growing sense of shared fate among young people is helping to transform the world, beginning in the United States. Governor Dean recalled his first year in college, in 1968, and how at that time it would have been absurd and crazy to consider the possibility of a black president. “For the first time they understand that there is no other – the other is them,” Dean said. Governor Dean, who was Vermont’s governor for five consecutive terms, explained how the Republican Party does not get this message and has ostracized many young voters by framing campaigns around social issues, criticizing the gay community, racial minorities, immigrants, etc. He said voters under age 35 are more conservative than democrats, somewhat libertarian but are socially much more liberal than republicans. Governor Dean went on to talk about his role within the Democratic National Committee in coordinating the widespread grassroots campaign to elect Barack Obama in 2008. Governor Dean said republicans were better at running campaigns than democrats – they are more organized, disciplined and better funded. That started to change that in 2004 with his presidential candidacy which eventually transformed into the advocacy nonprofit Democracy for America (formerly known as Dean for America). However, it was the Obama campaign in 2008 that made historic changes to the way democrats campaigned. It was a well-organized widespread grassroots strategy using new technologies. A key tool used during the 2008 and 2012 campaigns, started within the DNC by young 20-somethings as Neighbor to Neighbor, software used to connect organizers and volunteers with voters. Governor Dean stressed that internet, although helpful, is not the end. Dean went on to clarify how the Obama campaign strategy included all 50 states – a strategy first implemented by Dean in his 2004 campaign – even historically republican voting states like Utah and Texas. If time isn’t spent in a place like Utah now, there will be no chance to win that state in the future. As an example, the Governor recalled how he initially told Obama not to bother spending money in Florida because it was a lost cause. He was glad to be wrong when Florida voted democrat. Beyond political campaigns, Governor Dean praised young people who took action using tools including Change.org to petition Bank of America to reverse their decision to charge for checking accounts. He also credited young people for incorporating more social responsibility and ethics into business models. Dean cited how some young business owners are making it part of their mission to “do good” and preventing shareholders from suing the company if they do not maximize profits. He ended with a challenge of sorts – saying what young people are struggling with now is how to institutionalize the movement without denigrating the message or diluting the innovation. Members of the new 2012-13 UCLA Luskin School of Public Affairs board of advisors met in a newly refurbished conference room at the school on Tuesday morning to discuss the School’s strategic plan and initiatives for the upcoming school year. During the gathering, Dean Franklin D. Gilliam, Jr. announced the appointments of Chair Susan F. Rice and Vice Chairs Cynthia McClain-Hill and Michael F. Fleming. Members provided feedback on the school’s mission statement and putting the strategic plan into action, and heard presentations by social welfare assistant professor Ian Holloway and social welfare Ph.D. candidate Sara Pilgreen. 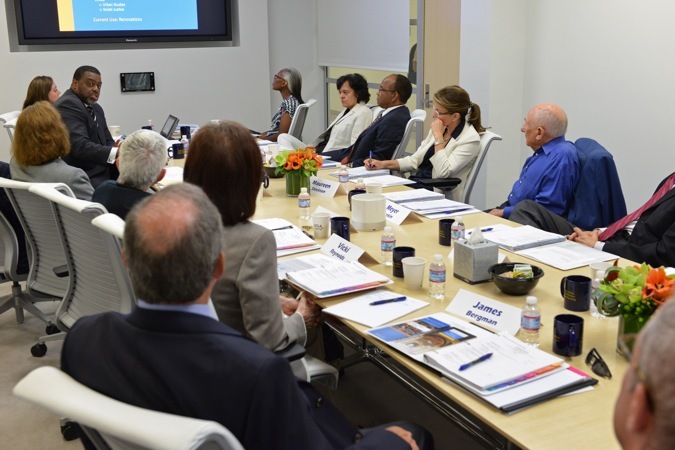 The Luskin board of advisors is made up of civic leaders, business executives and social entrepreneurs. The full board meets twice annually in an effort to shape the School’s vision and strategic plan.